12 Beers of Christmas was held at the beautiful Morimoto Asia restaurant in The Landing neighborhood at Disney Springs, and the event ran from 11:30 AM – 3:30 PM. 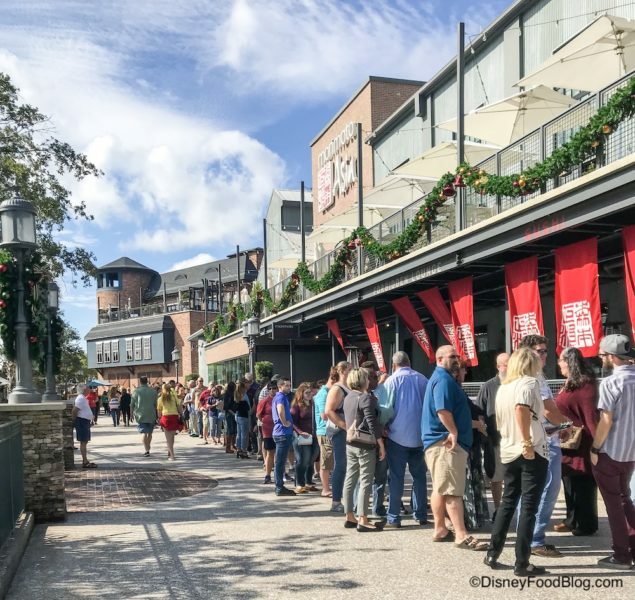 This was a very popular event, and guests started to line up around 11:00 AM. 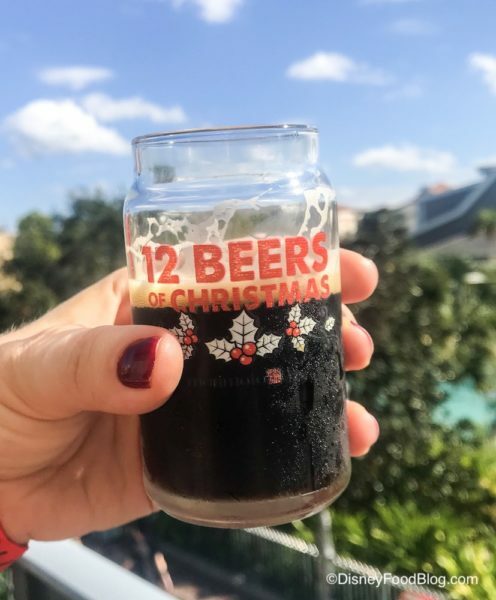 Upon entering, each guest was given a miniature 12 Beers of Christmas beer glass to use at each station throughout the event. 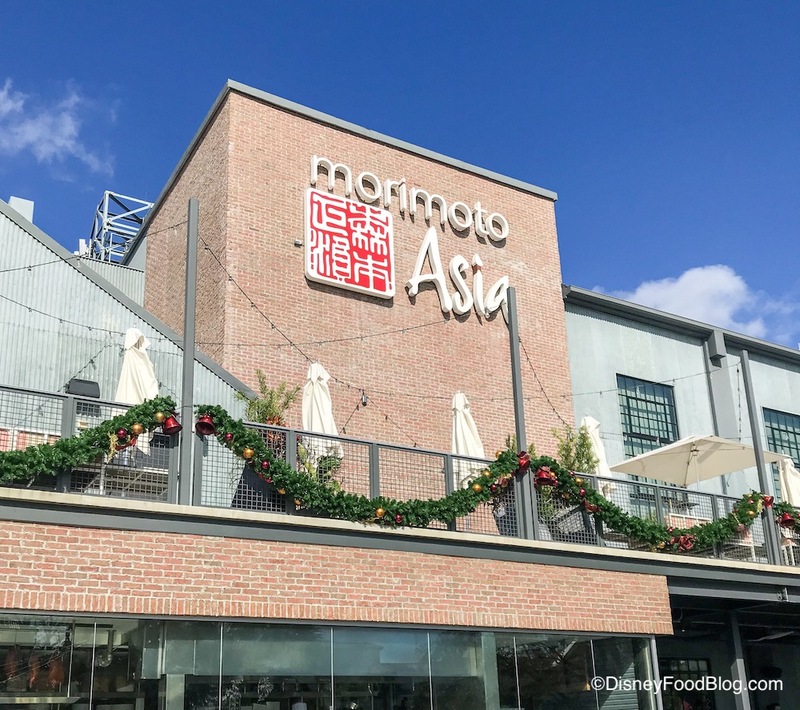 Chef Morimoto’s new cookbook, Mastering the Art of Japanese Home Cooking, was available to purchase at the event, and proceeds went to Give Kids The World. 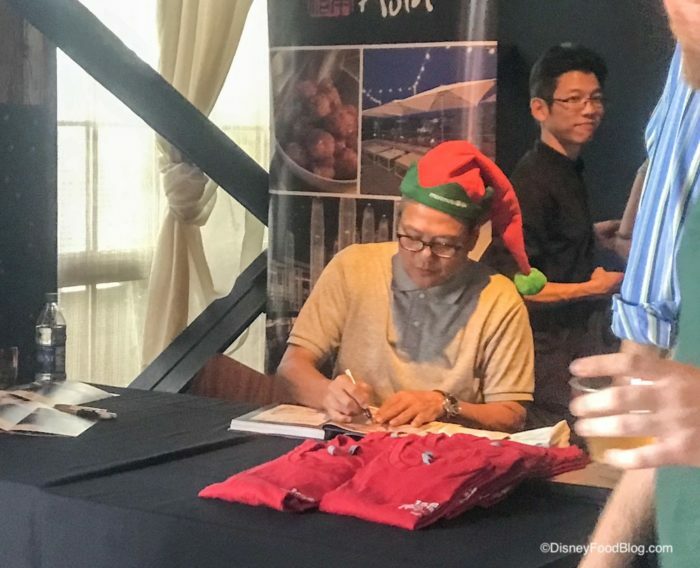 The Iron Chef signed cookbooks and t-shirts, and as you can see, he brought plenty of holiday cheer. Let’s get to the stations, shall we!? 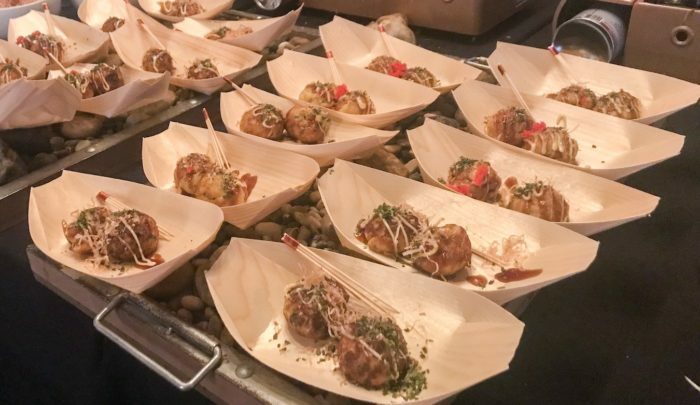 The Takoyaki station featured traditional-style Japanese octopus center. 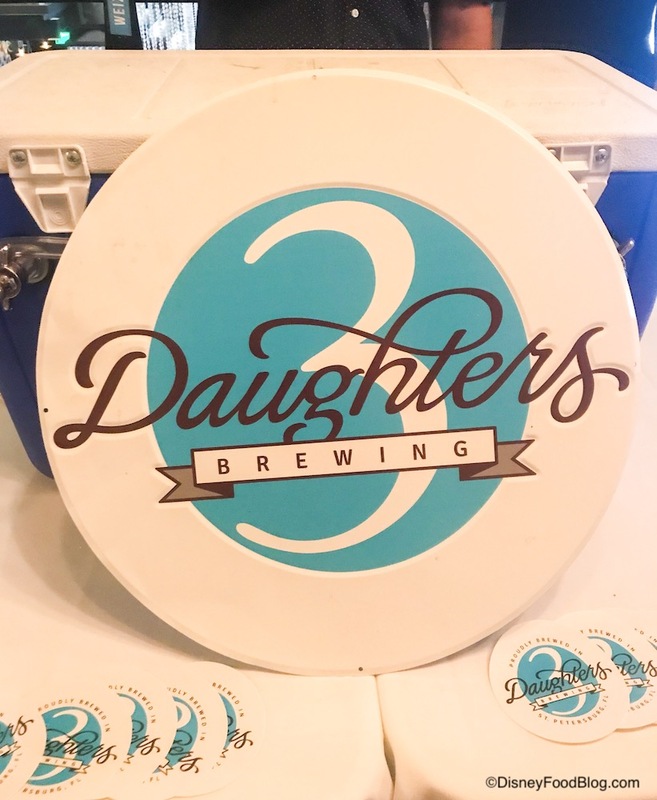 The beer pairing for this station was WinterWeizen from 3 Daughters Brewing, which is based in St. Pete, FL. WinterWeizen is a German-style specialty wheat beer that’s only available during the month of December. At the Yakitori station, we found Momo (dumplings), Tsukune (chicken meatballs), Teba (Japanese-style chicken wings), and Shishito (peppers). 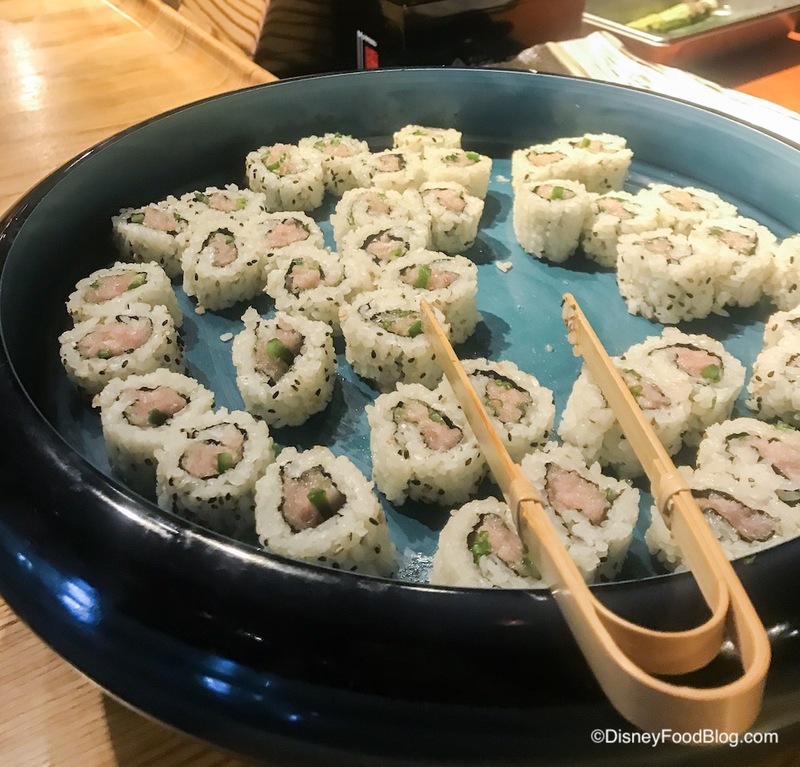 The Tsukune was definitely the standout at this station! 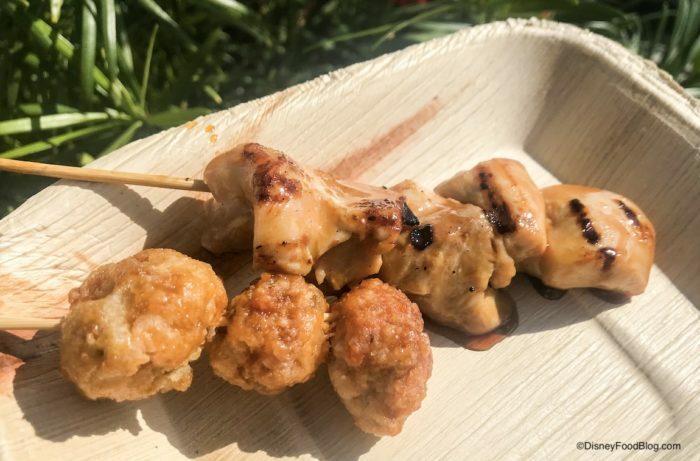 These chicken meatballs were tiny but had a ton of flavor and a really nice, crisp texture. 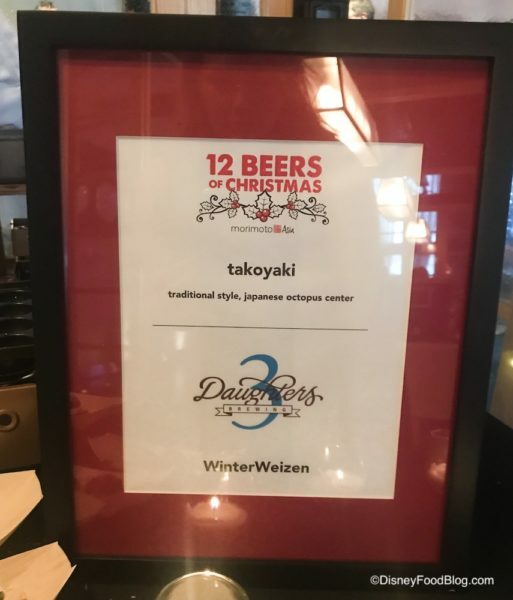 The Yakitori was paired with Crooked Can Brewing Company Black Frost Schwarzbier. 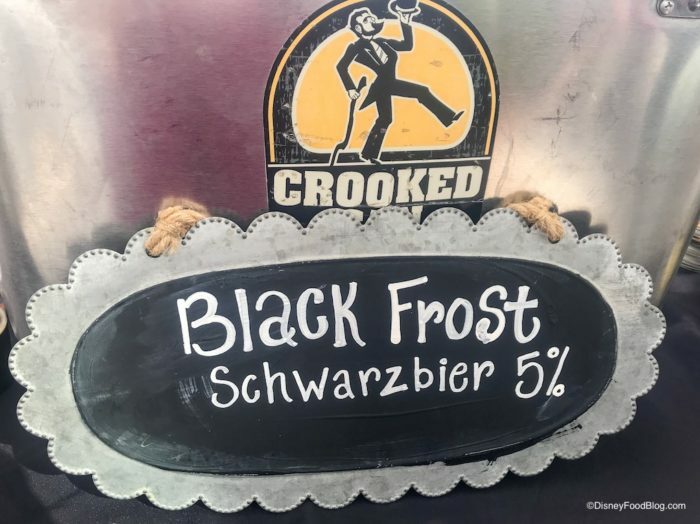 Crooked Can is based in Winter Garden, Florida. This was one of our favorite beers at the event, too! Black Frost was nice and smooth with a just hint of espresso. We were pretty excited for this one! The Duck Ramen was super flavorful and so nice for this time of year. If you’re not a fan of duck, though, it might not be for you. The accompanying beer was Spook Hill Pale Ale from Red Cypress Brewery in Winter Springs, Florida. 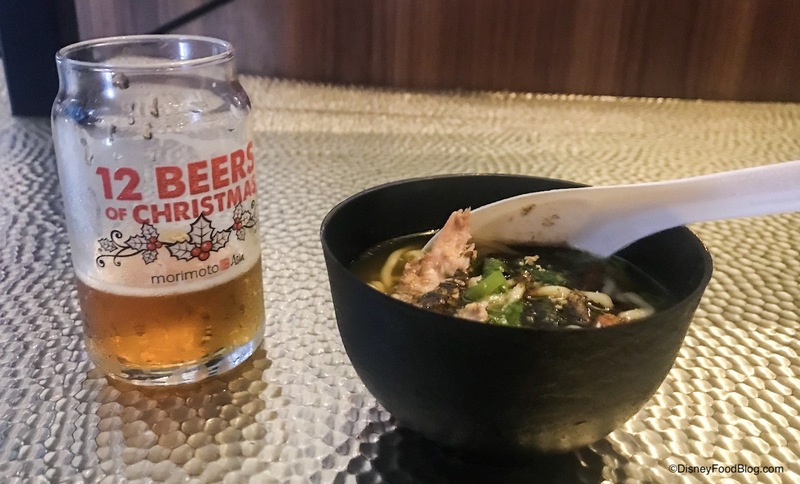 Just like the Duck Ramen, Spook Hill Pale Ale also has tons of flavor. It’s an intensely citrusy, extra-hoppy IPA. 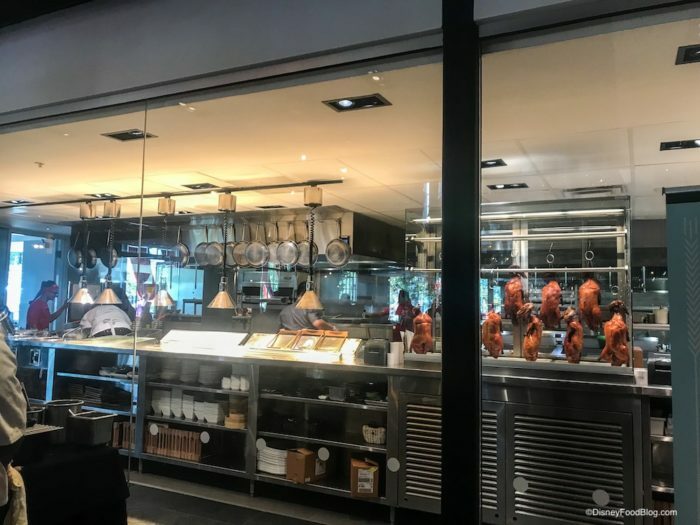 Said to be “the best ribs you’ll ever have” and “so tender the meat just falls off the bone,” we were excited to find Morimoto Spare Ribs at the next station. 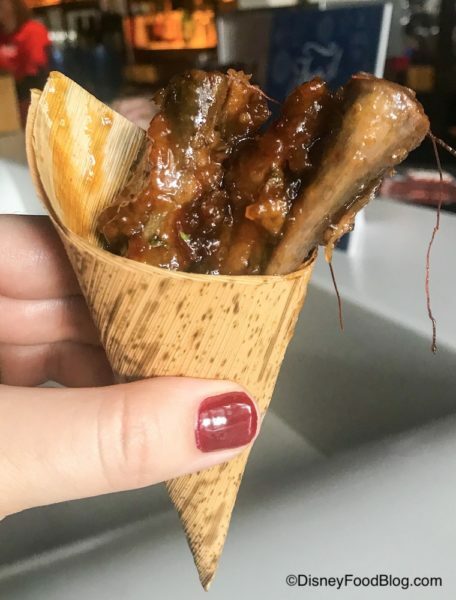 The ribs were indeed very tender, and Chef Morimoto’s sweet hoisin chili sauce gave the meat a lovely flavor that was sweet, salty, and just a little spicy. 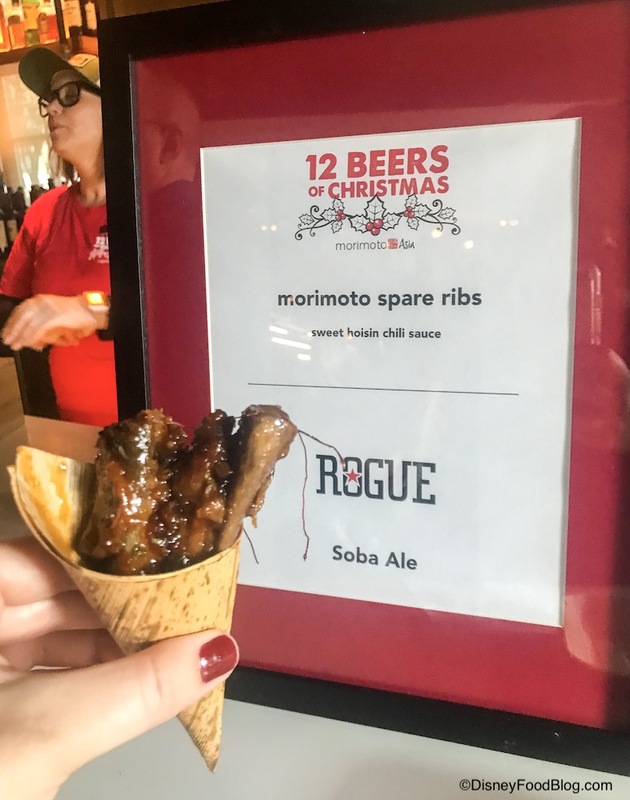 The Spare Ribs were paired with Morimoto Imperial Pilsner from Rogue Ales in Newport, Oregon. The representative from Rogue described Morimoto Imperial Pilsner as being smooth, having a slightly floral flavor, and pairing well with every dish served at 12 Beers of Christmas. 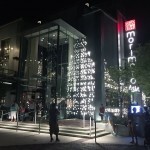 Note: the station signage lists the beer as Rogue Soba Ale, but we were served Rogue Morimoto Imperial Pilsner. How gorgeous is this!? 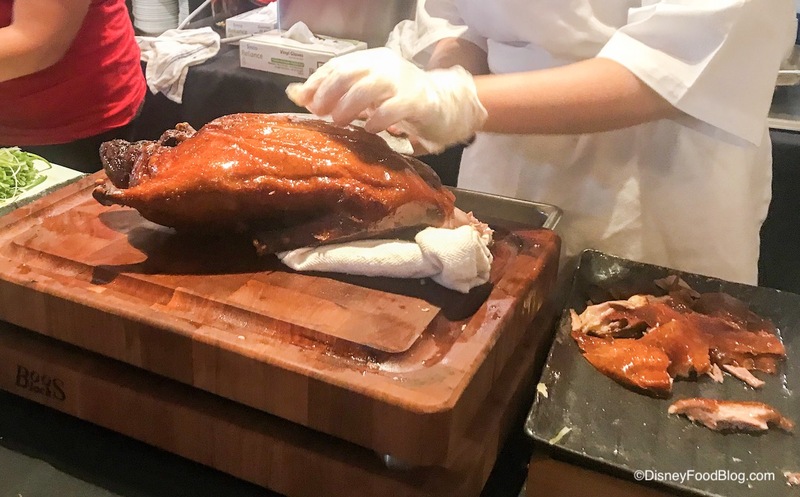 The Morimoto-style Peking Duck was presented with pancake, hoisin, and apricot chili. 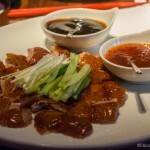 If you’re into the distinctive flavor of duck, you’ll love the juicy meat and crispy skin. 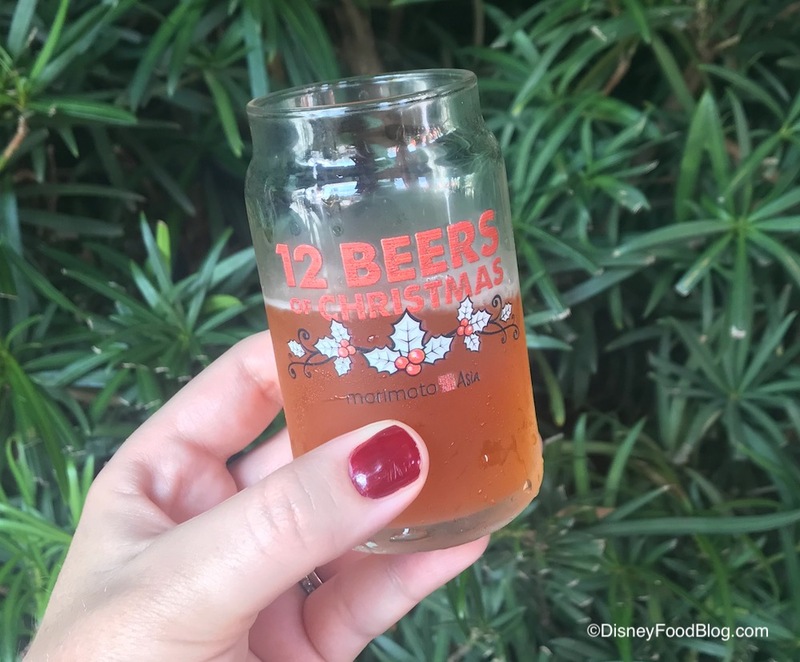 The beer at this station was one of the event’s more unique offerings: Coffee Gold from Cask and Larder in Orlando, Florida. It was sharp, a bit bitter, and had a pronounced coffee flavor. If you’re a fan of beer and coffee, you might just love Coffee Gold. Trivia time: Cask and Larder belongs to the same family of restaurants as The Polite Pig at Disney Springs! Next, tacos! 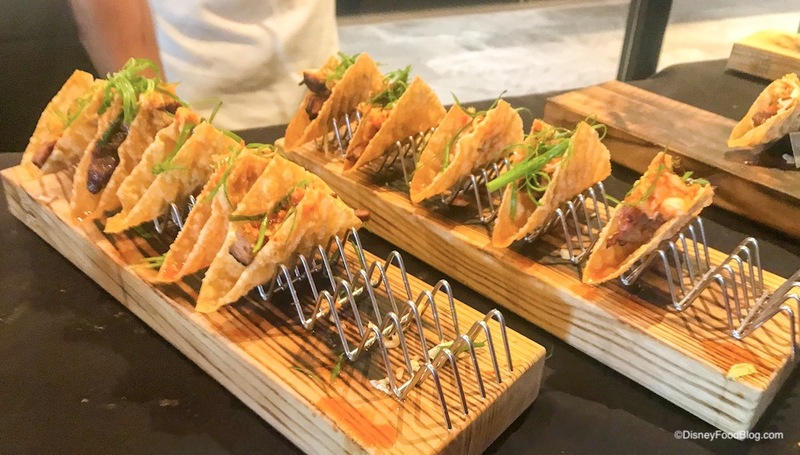 These weren’t just any tacos, though: they were tacos with a Pan-Asian twist! 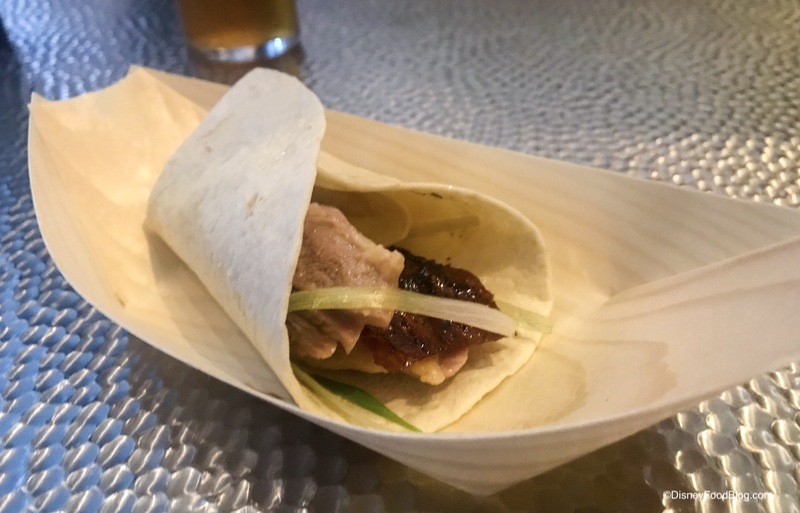 The BBQ pork and kalbi (Korean BBQ beef) were just a little spicy, and it made for such a nice combination with the light, crisp taco shells. The beer? 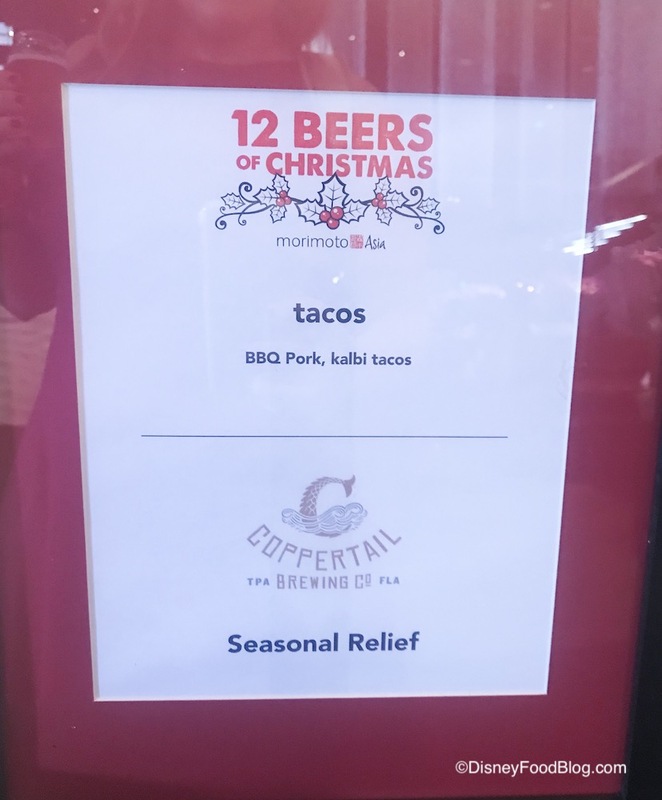 Seasonal Relief from Coppertail Brewing Co. in Tampa, Florida. It’s a Baltic Porter brewed with goji berries. You might taste a hint of chocolate, too! If we had to pick a favorite station, Yakisoba would definitely be one of the top contenders. 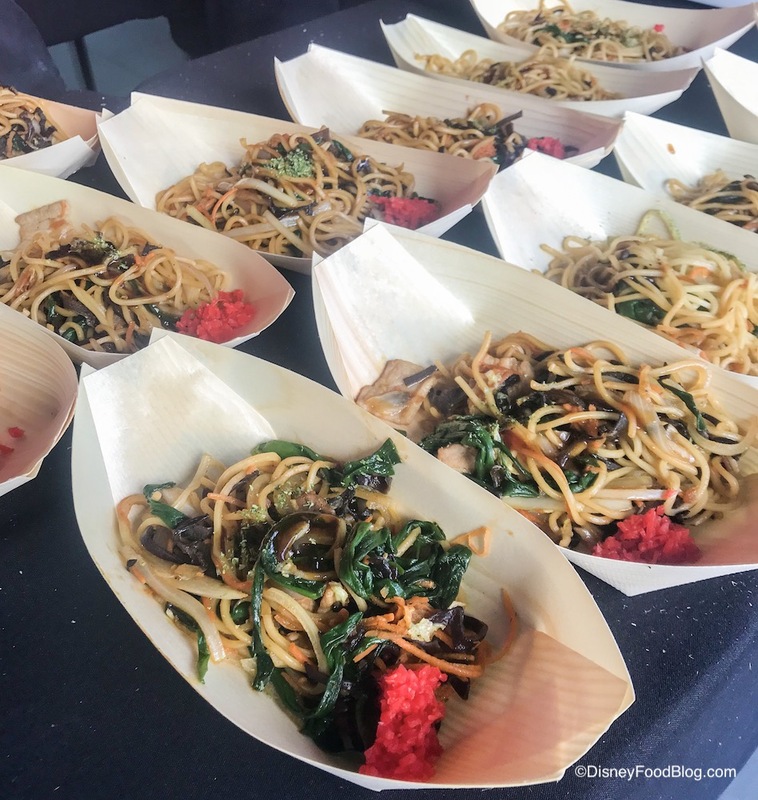 These noodles were not only delicious, but they had the perfect texture, too. The cabbage added a pleasant crunch. 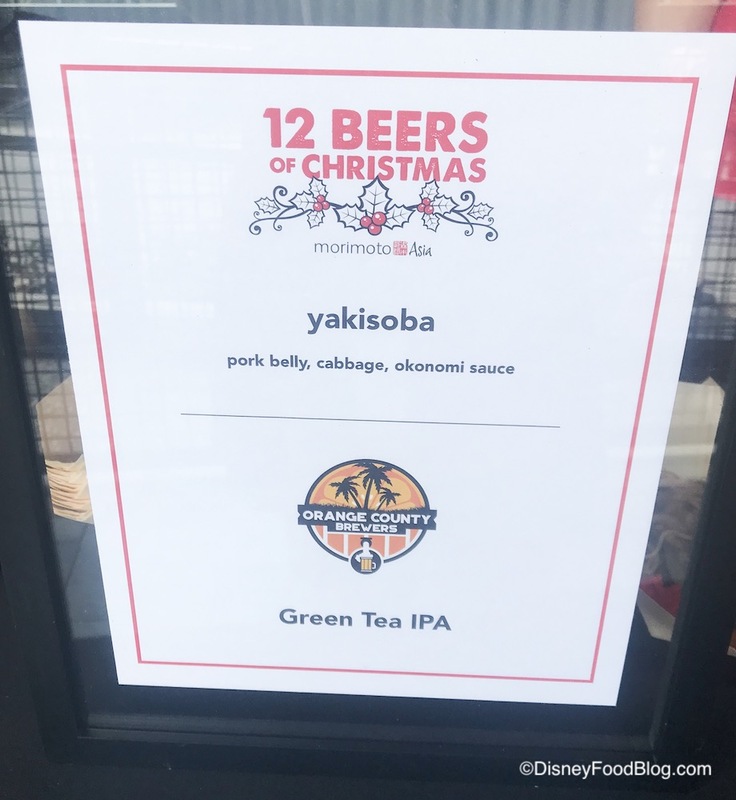 The Yakisoba came paired with another unusual-to-us beer: Green Tea IPA from Orange County Brewers in Orlando, Florida. The green tea notes and IPA flavors were both very strong, and this was one interesting beer! Green Tea IPA would be just as refreshing on a hot summer day as it was on this winter afternoon. The Gyoza and Dimsum station offered several varieties of dumplings filled with chicken, shrimp, and pork. 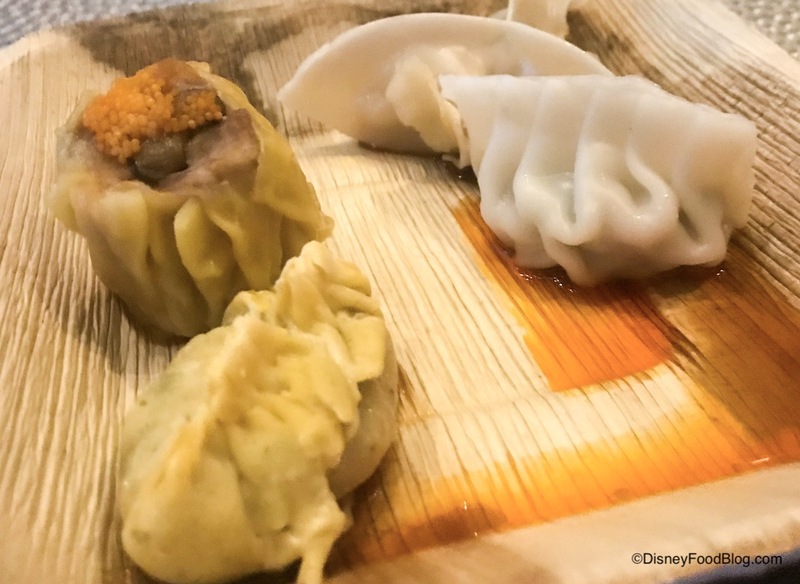 Dimsum sauce and chili sauce were optional. Throughout the event, there was always a crowd at the Okonomiyaki station. 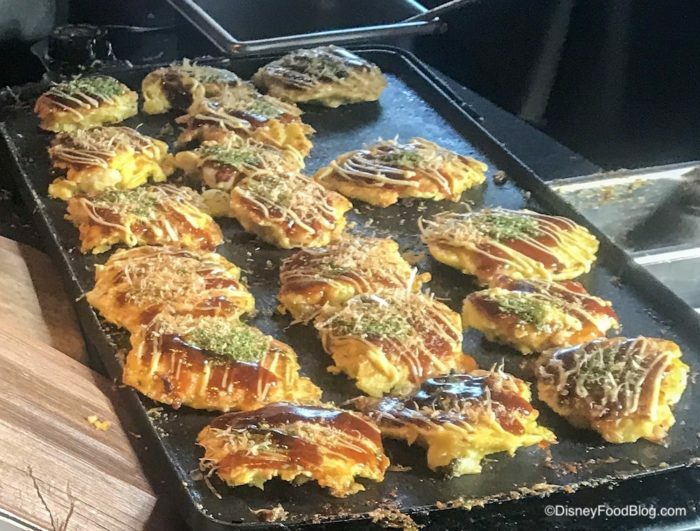 Okonomiyaki are savory seafood pancakes. Don’t they look tempting!? The seafood pancakes were paired with Baird Beer Jubilation Ale. Baird Beer is based in Numazu, Japan. 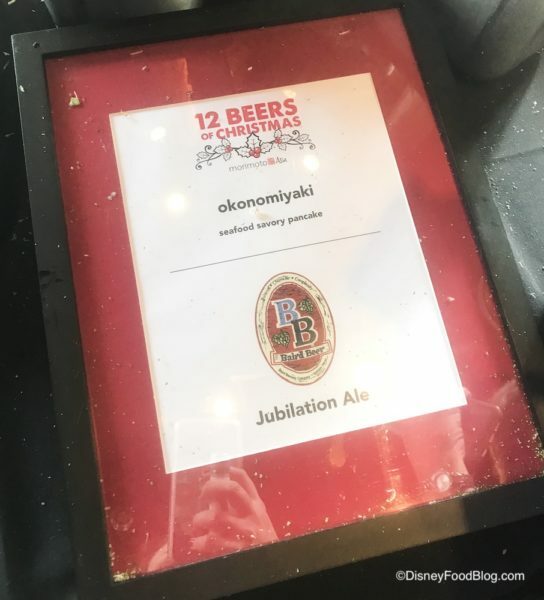 They describe Jubilation Ale as complex and figgy with a hint of cinnamon. 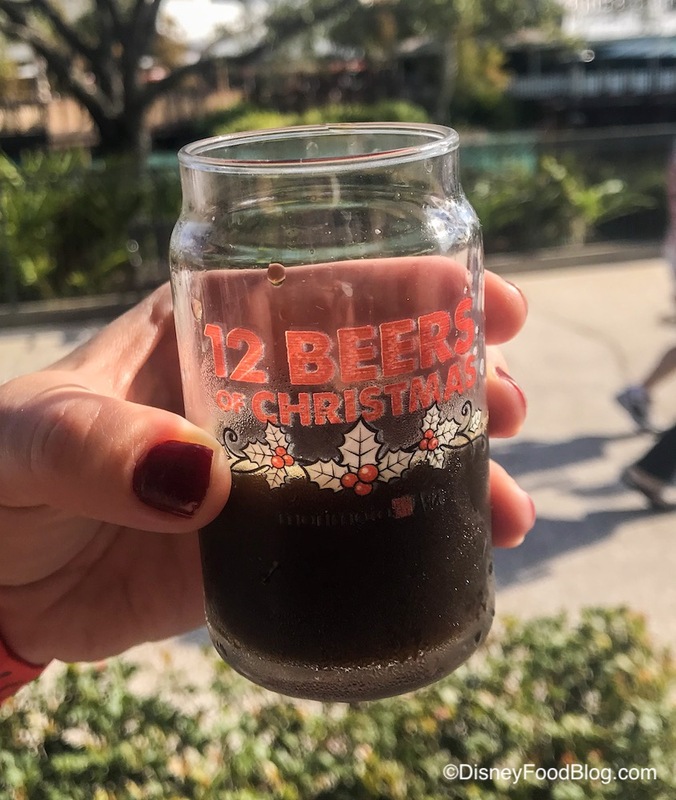 The Baird Beer booth also brought some delicious-sounding cherry wine, and the guests at 12 Beers of Christmas must have agreed, because it was all gone by the time we got there. We may or may not be a little sad about missing it. 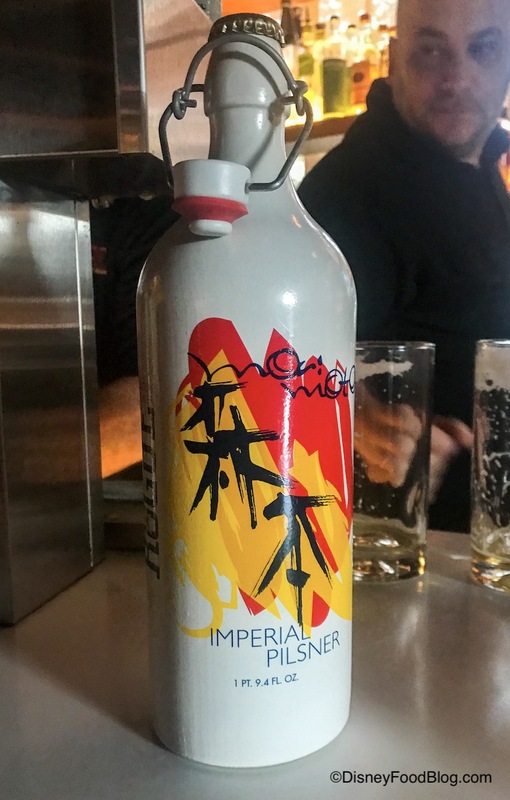 To complement flavors at the sushi station, Hourglass Brewing from Longwood, Florida, brought in their Saison du Sablier. Fermented in an oak barrel, Saison du Sablier is a dry, Belgian-style beer. 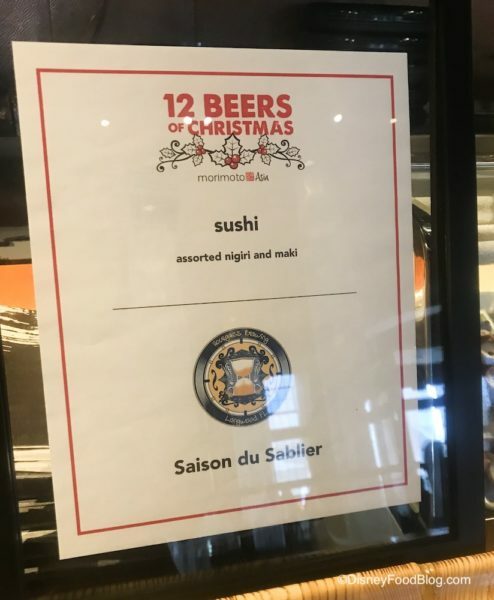 The sushi station was undoubtedly the most popular station with the guests at 12 Beers of Christmas. 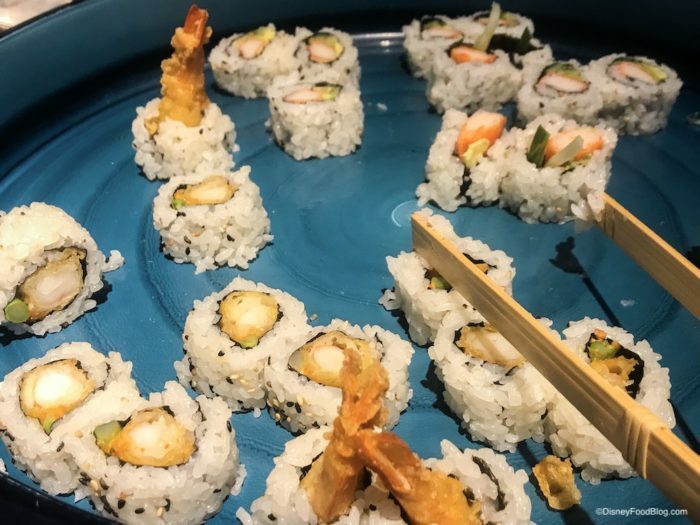 Assorted varieties of nigiri and maki were presented beautifully. Meanwhile, at the Raw Bar, we found oysters, shrimp cocktail, and ceviche. 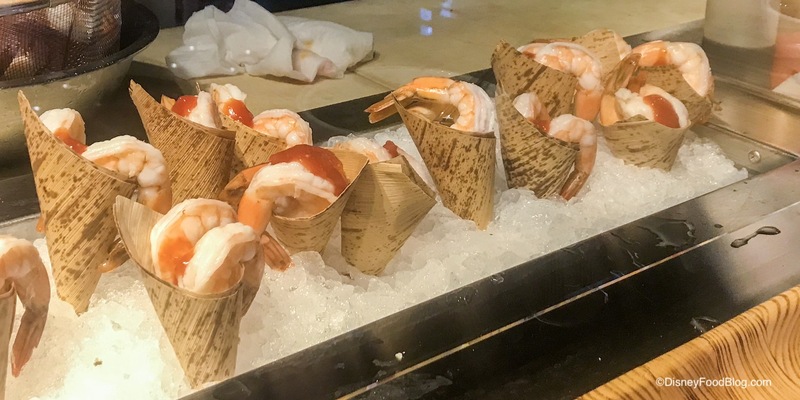 The foods at the raw bar were presented so artfully, and just like the sushi station, it was very popular with guests! For the beer pairing, Redlight Redlight from Orlando, Florida brought Dama en Gris. 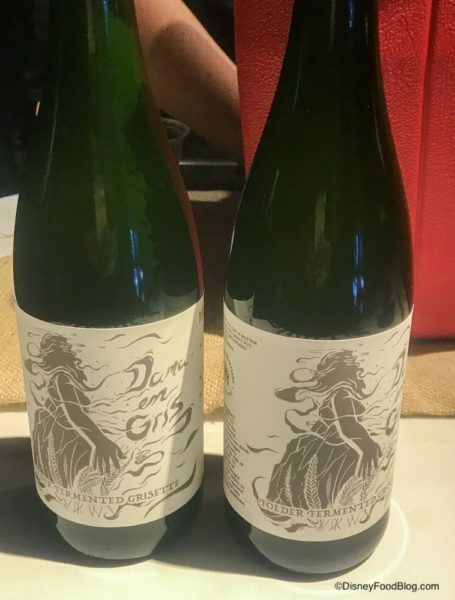 Dama en Gris is a light, European-style beer (Grisette). The Redlight Redlight team described it as light and lemony, similar to a Saison. 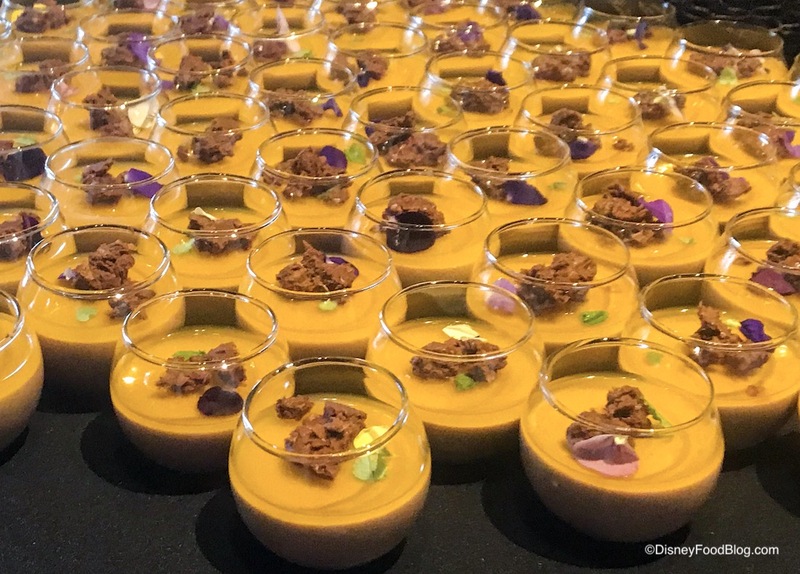 If we were picking favorites, the Dessert station would definitely be in the ranks! 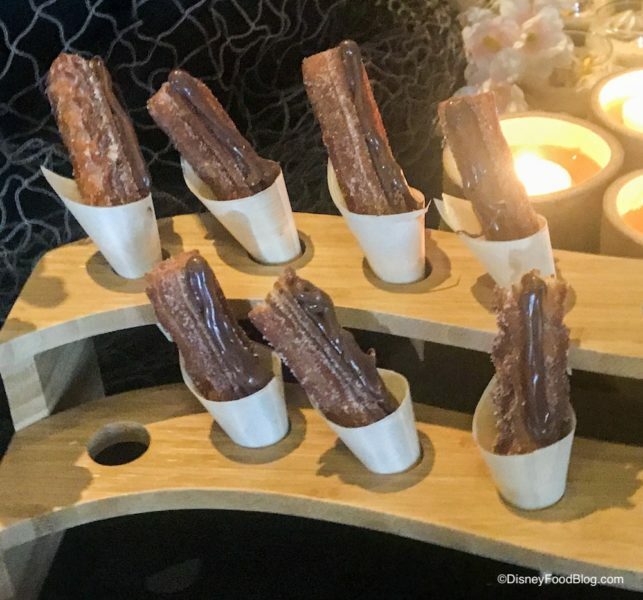 These miniature churros might just have been our favorite food from the entire day. They were warm with crisp, cinnamony exteriors and soft, pillowy interiors. 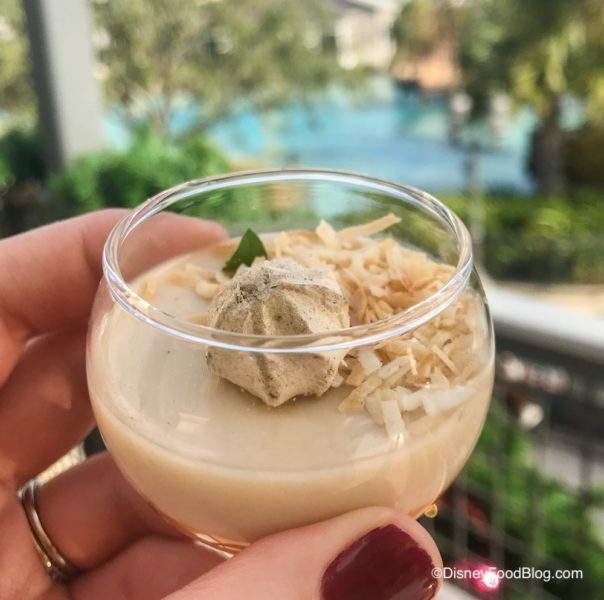 The Miniature Chocolate Cream and Yuzu Desserts were just as delicious as they were adorable. How cute is that!? 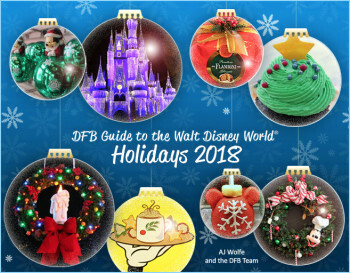 So detailed! So tiny! 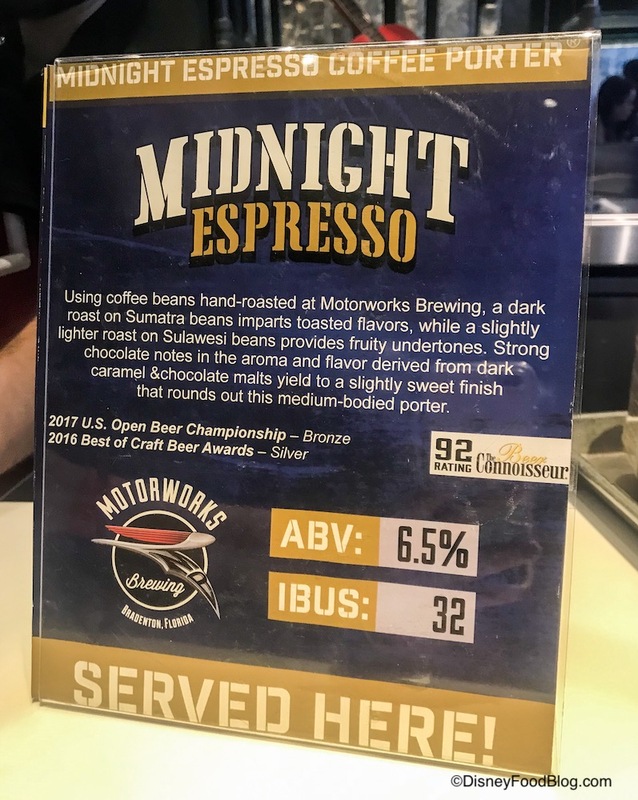 Midnight Espresso from Motoworks Brewing in Bradenton, Florida was the beer pairing for the dessert station. 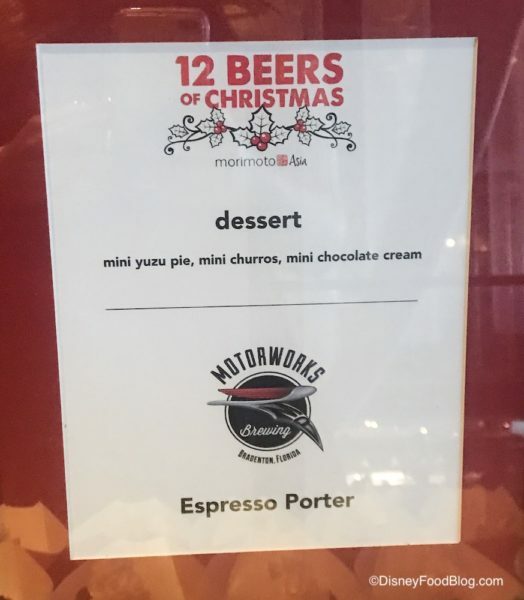 The flavors of espresso and chocolate were strong without being overwhelming. 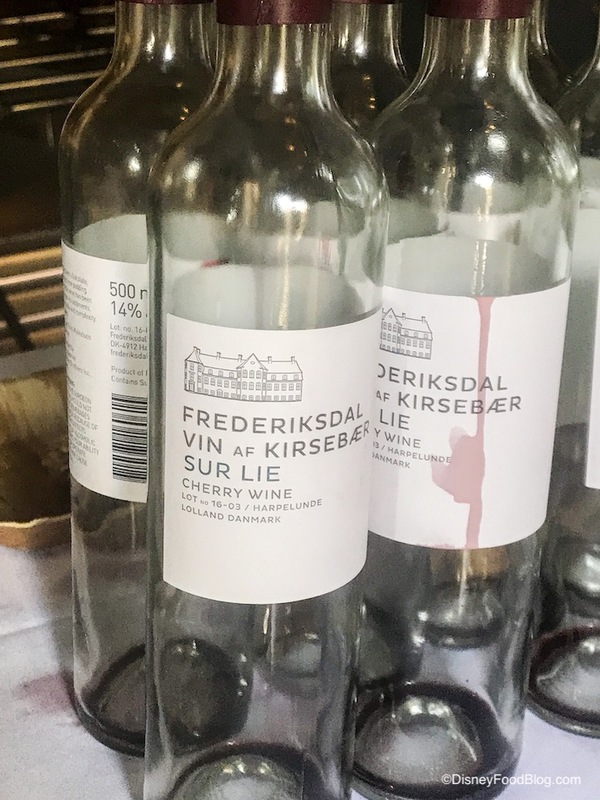 We wouldn’t be able to drink a lot of this one, but it was a nice pick for the desserts. 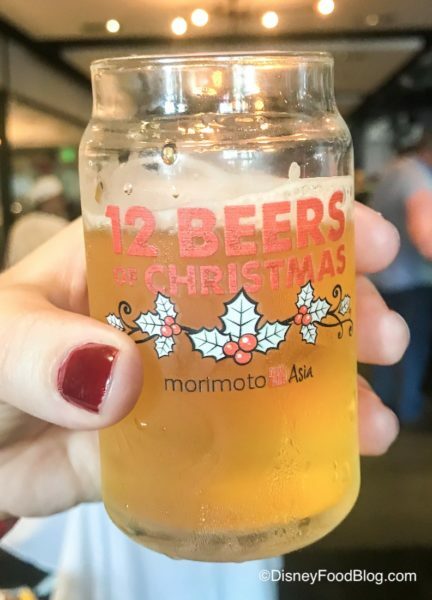 And that’s everything we tried at Morimoto Asia’s 12 Beers of Christmas! Should you make an effort to attend Morimoto Asia’s 12 Beers of Christmas next year? 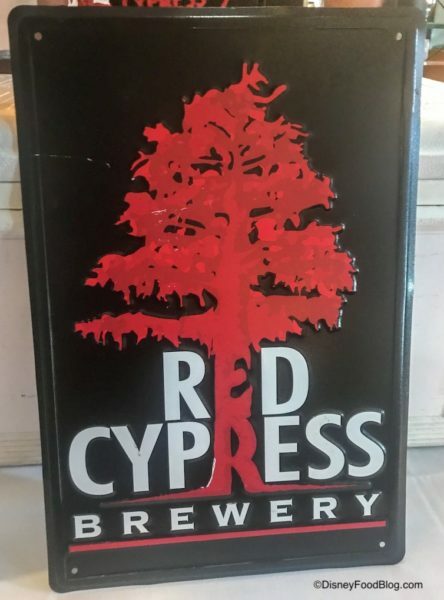 If you’re really into beer – especially uncommon beers from local craft breweries – it’s probably something you’ll enjoy. 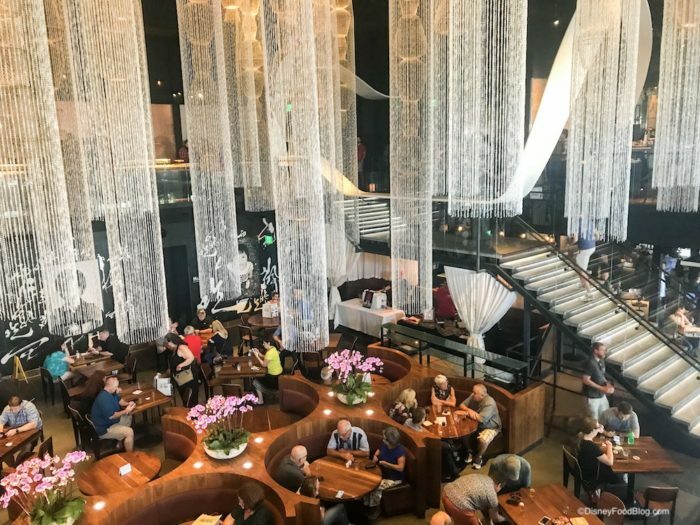 Similarly, if you’re a fan of Chef Morimoto or Pan-Asian cuisine, it’s a great opportunity to try a variety of small bites and to experience the restaurant’s gorgeous interiors. Tickets were $55, and guests were not limited in the number of times they could visit each booth. That’s right – if there’s something you love, you can have it more than once! Keep in mind, though, that some of the more popular booths did run out of some foods and drinks. If there’s something you absolutely have to have, hit that booth first. Tables and seating were limited at 12 Beers of Christmas, and it got a little challenging to maneuver our beer glass, our food, and our utensils. Also, lines got long — it was a little stressful! 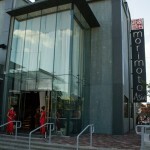 We recommend going with a small group of friends, arriving early, and grabbing a table. That way, you can rotate having one person at the table while the others visit booths, and you’ll never have to worry about having a place to set your beer or your food. 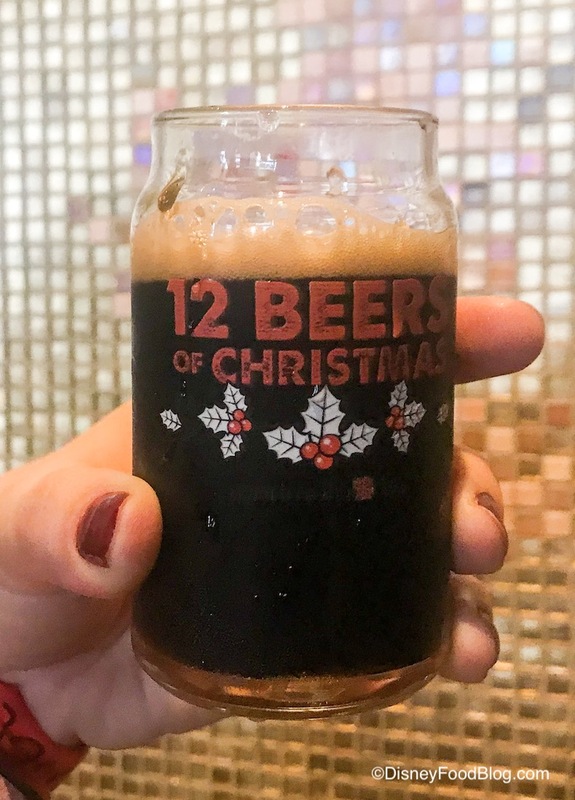 12 Beers of Christmas is an adults-only event, and you must be 21 or older to attend. 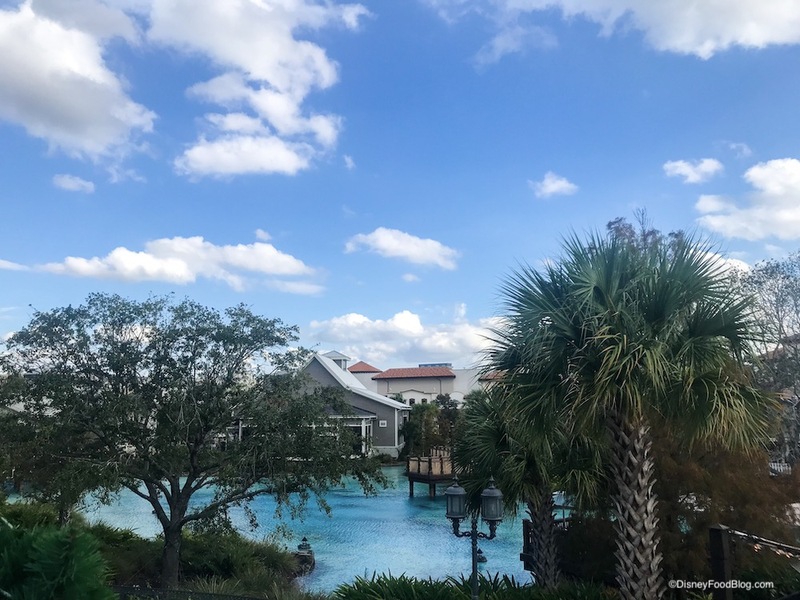 If you’re looking for a family-friendly outing at Disney Springs, this isn’t it, BUT there are plenty of other great options for you. 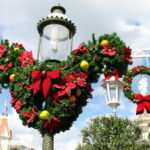 Check out the Christmas Tree Trail or Breakfast with Santa at T-Rex Restaurant for some festive fun! 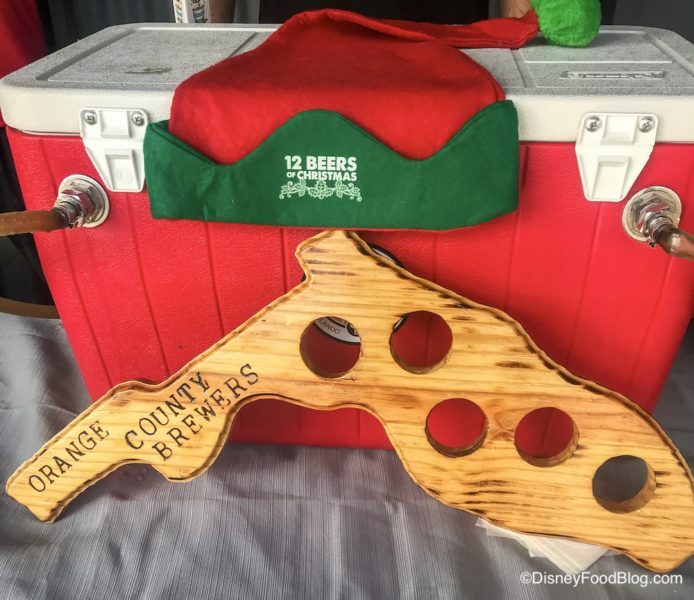 Missed 12 Beers of Christmas, but you’re still curious about some of the beers? 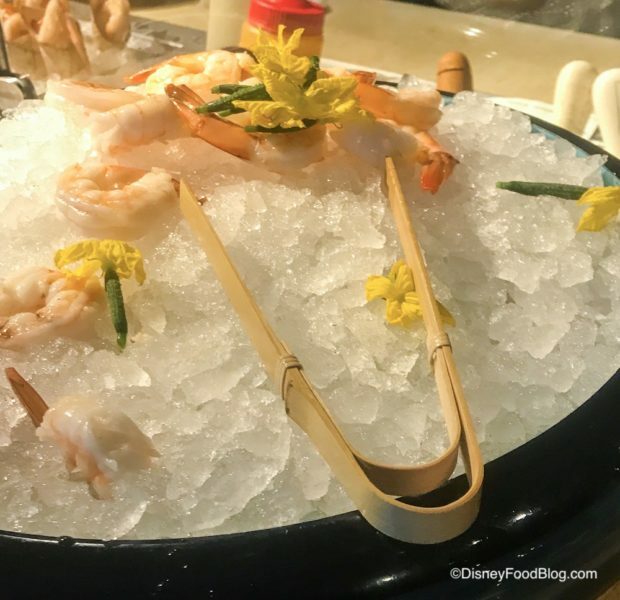 You’re in luck, because several of them are on the Morimoto Asia menu this December! And if you’d rather skip the tasting events and just have a special dinner, check out our Morimoto Asia review right here. 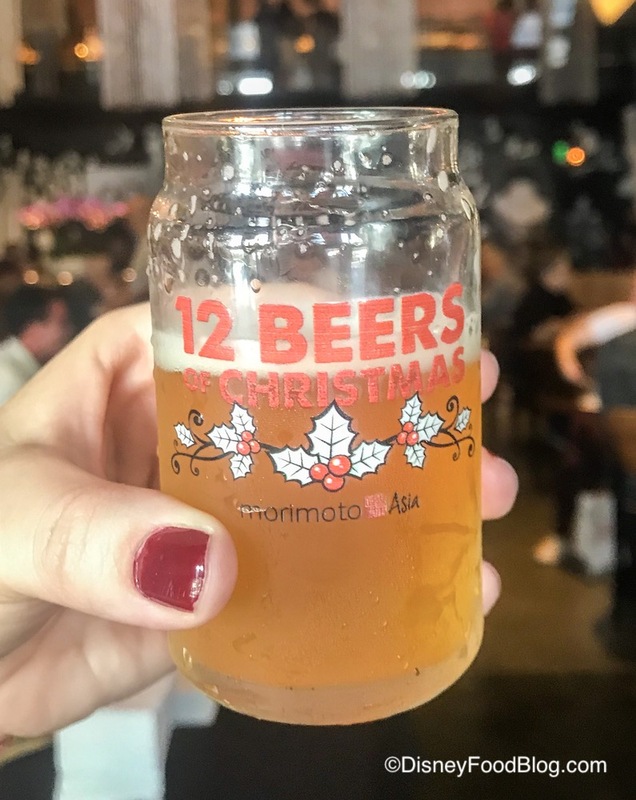 In short: beer enthusiasts, 12 Beers of Christmas is the perfect event for you. 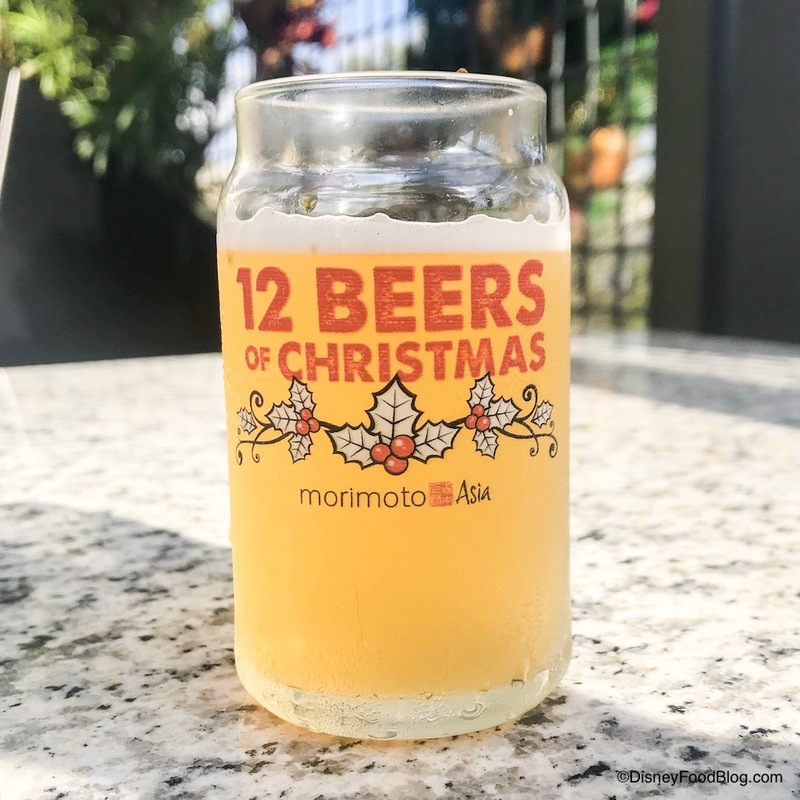 Have you attended Morimoto Asia’s 12 Beers of Christmas in the Past? Leave a comment and let us know what you thought!